I’ve interviewed Steve Coogan a couple of times. Once as himself, and on another occasion with him in character as Alan Partridge. Coogan called me a couple of days before the Partridge interview to talk through logistics. He asked how I intended to approach the interview. Light-heartedly, I said. Coogan advised otherwise, and suggested I play it completely straight. On the basis that, the more seriously I appeared to take the interview, the funnier he could be. My role in the makeshift comedy double-act was to play, as they say in showbiz, second banana. He was right. It worked a treat. As does his portrayal of the legendary comedian Stan Laurel in the biopic Stan & Ollie. He makes no attempt to play the role for laughs – although routines are lovingly reprised or referenced – instead presenting us with an anxious and earnest ageing performer trying vainly to engineer a return to the glory days for him and his comedy partner. That’s where we first meet them, at their peak in 1937, preparing to shoot a tightly choreographed dance routine for their latest movie, Way Out West. 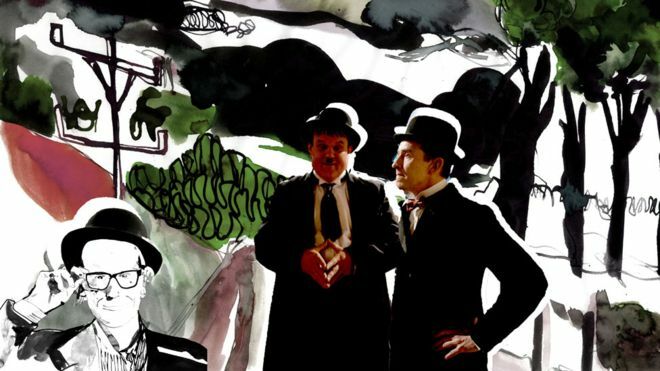 Stan is moaning to Ollie (played superbly by John C Reilly) about how little they are paid in comparison to other screen comedians such as Charlie Chaplin, for whom Laurel once understudied back in England’s old music halls. Now, he and Ollie are two of Hollywood’s biggest stars, but without the pay packet to match. Stan wants to end their contract at the Hal Roach Studio, but the more laidback Ollie – or Babe, as friends knew Hardy – isn’t so sure. After all, Roach was to them as Simon Cowell is to One Direction: he was the man who put them together and in doing so created what is possibly the greatest on-screen comedy double-act of all time. Ollie stays, Stan leaves the studio, and, within a few years, so does the magic, even after they are reunited. By 1953 they find themselves washed-up in England, standing outside a dreary-looking pub in the pouring rain where they have two very basic rooms booked at the start of their largely unheralded tour of the UK. Ollie is sanguine, while Stan is in denial and refusing to accept a final chapter that would see the Oscar-winning comedians end their career in near empty provincial theatres. What follows is a gentle, nostalgic exploration of their relationship – a bromance of sorts, with all the little tiffs and harboured grudges that are part-and-parcel of any love story. Ollie wants to relax, play golf, and have a bet on the horses. Stan is a workaholic, constantly writing new material, pitching movie ideas, and coming up with publicity stunts. They are the very definition of the archetypal odd-couple off screen just as thy are on it, where Laurel is a skinny, timid Englishman and Hardy an overweight bossy American. Coogan and Reilly play them as two lovable but languishing old boys in this warm-hearted tribute to a couple of greats from a bygone age.